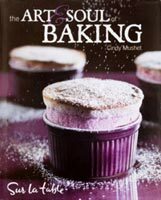 This month, Cindy Mushet’s newly published book, The Art and Soul of Baking, garnered a positive review by Gourmet Magazine. Mushet’s book will be sold through Gourmet‘s Cookbook Club. 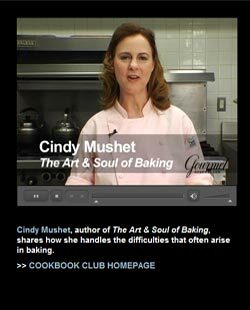 See the Cindy Mushet video: Tips to fix common baking problems at Gourmet‘s website. Cindy Mushet stopped by today. I first made her acquaintance when I was in Burbank. At the time, she had just begun to write and publish the baking journal, Baking with the American Harvest. Now, she’s the Chef Instructor of Baking and Pastry at Le Cordon Bleu Culinary School here in Pasadena. I asked her to sign my copy of Desserts: Mediterranean Flavors, California Style. Look for her new book, The Art and Soul of Baking by Cindy Mushet and Sur La Table on October 27 or read the baking blog she writes for Sur La Table.